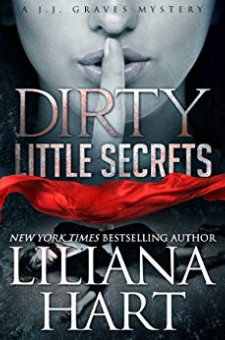 DIRTY LITTLE SECRETS: A J.J. GRAVES MYSTERYJ.J. Graves has seen a lot of dead bodies in her line of work...She's not only in the mortuary business, but she's also the coroner for King George County, Virginia. When a grisly murder is discovered in the small town of Bloody Mary, it's up to J.J. and her best friend, Detective Jack Lawson, to bring the victim justice.The murders are piling up...When a popular mystery writer shows up on J.J.'s doorstep with plans of writing his new book about the Bloody Mary Serial Killer, J.J. has to decide if he might be going above and beyond the call of duty to create the spine tinglers he's so well known for. Passions are rising...J.J and Jack discover each victim had a shocking secret, and the very foundation of J.J.'s life is in danger of crumbling when it turns out she’s harboring secrets of her own—secrets that make her a perfect target in a deadly game. OTHER MYSTERY/SUSPENSE TITLES BY LILIANA HART:WHISKEY REBELLION: AN ADDISON HOLMES MYSTERYWHISKEY SOUR: AN ADDISON HOLMES MYSTERYA DIRTY SHAME: A J.J. GRAVES MYSTERYCADE: A MACKENZIE NOVELSECRETS AND SATINSHADOWS AND SILKSINS AND SCARLET LACEKILL SHOTCATCH ME IF YOU CANWhat Readers Are Saying:"Look out Janet Evanovich, here comes Liliana Hart! ""This is my first book by Liliana Hart but not my last.""Ms. Hart has constructed a well-developed plot with enough twists to keep me reading long past bedtime."